The Board approved six groups of capital projects that collectively address state-of-good-repair (SOGR). The degree to which each project affects Line 1 can be seen in the subdivision of overall project costs and those assigned to that line. “LV Feeder Cables” refers to “Low Voltage” as opposed to the traction power used by the trains. The isolating switches are used to selectively disconnect portions of the third rail power supply for operation during emergencies or scheduled partial shutdowns. As originally designed, the crossovers on the Yonge line at Rosehill (St. Clair), Bloor, College and King also corresponded to breaks in the power feeds. If there is a power cut at Queen, for example, this affects power from north of King Crossover to south of College Crossover making both crossovers useless for turnback operations. The addition of isolating switches and breaks in the third rail allow power to remain one train length either side of a crossover even if there is a power cut beyond that point. These changes were made many years ago when the crossover at Bloor was electrified, and a comparable arrangement was added more recently west of Broadview Station so that it could be used as a terminal when power is cut for work on the Prince Edward Viaduct. All of these projects thread together over the next four years as shown below. For 2019 and 2020, the view is detailed both by group of project and physical location. Demand and congestion on the Line 1 YUS have been growing for well over a decade. During the mid-1990s, in the aftermath of the recession, subway riding had fallen and this gave the false sense that there was plenty of headroom including for the Richmond Hill extension. That ceased to be a valid assumption years ago. In the chart below, the severe problem of 2010 was slightly relieved in 2016 by the introduction of higher-capacity trains, but that benefit has been consumed by latent demand. Any rider north of Eglinton will chuckle to think that the status of their trains is “less than 85% full” when they cannot even board. This chart begins the entire exercise with an air of unreality, the sort of thing that has delayed expansion of transit capacity into the core for far too long. 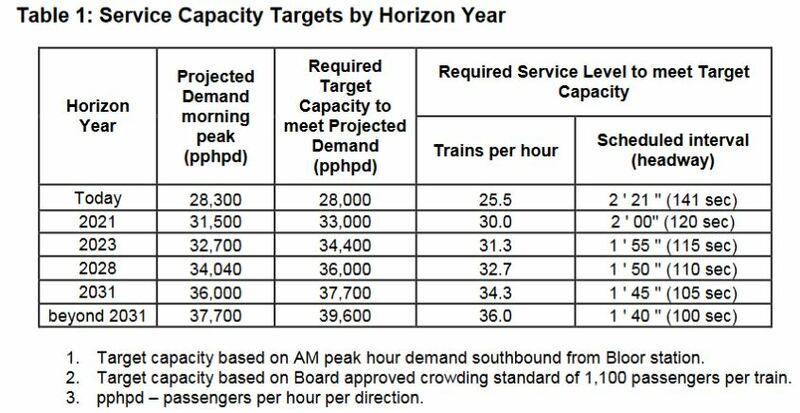 The projected demand on Line 1 will grow substantially in coming years as shown in the chart below. There is a major problem with this chart in that the TTC has rarely spoken of operating anything better than 110 second headway, corresponding to 2028 projected demand, and there is very good reason to believe that this is impossible, at least over the entire route because of constraints at terminals and dwell times at major stations downtown. At best, the TTC could selectively insert “gap trains” along the way to supplement capacity and boost the trains/hour count at the most crowded location. However, this cannot be sustained for an entire peak period. This is the conundrum underlying the Relief Line which the TTC downplayed for many years preferring to concentrate on packing more riders onto the line they had. 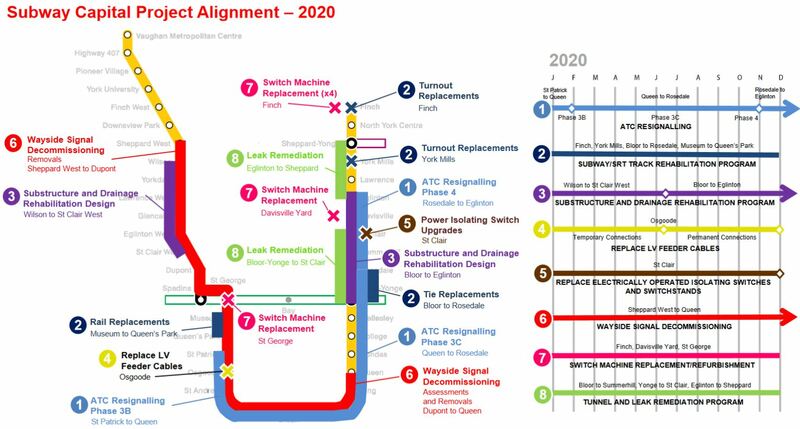 An overly optimistic view of Line 1 capacity will lead to severe problems with the subway network in the coming decade if alternate capacity remains on the drawing boards. Turnback procedures at Vaughan and Finch Stations prevent trains from leaving as expeditiously as they might. This includes crew management and breaks, as well as end-of-line train cleaning. Turnaround times are affected by train length and terminal geometry which dictates the cycle time for a train to arrive and leave even for a completely automated operation. 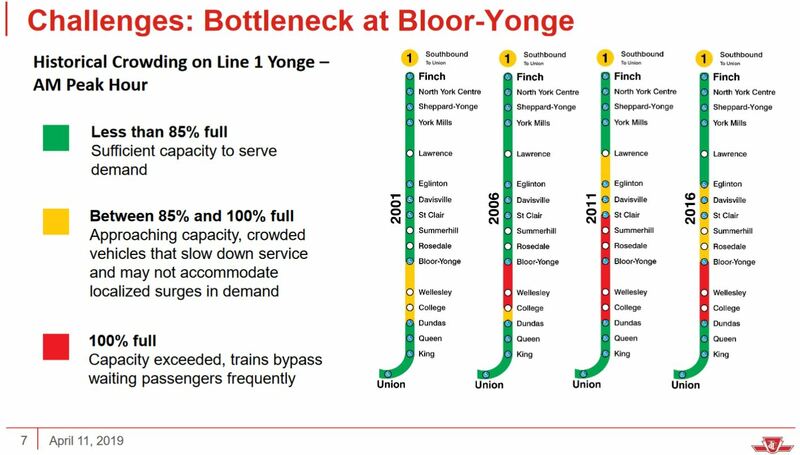 Bloor-Yonge Station cannot handle a higher rate of passengers attempting to transfer between lines and move through the station. Other major stations might not be able to handle the higher rate of passenger arrivals so that platforms could be cleared between trains. Station dwell times are affected by train and platform crowding. Attempting to operate the system beyond a reasonable design capacity, as opposed to crush loading, is counterproductive because it forces trains to sit longer in stations and reduces the throughput of trains. Platform edge doors may be required to ensure safe operation under crowded conditions. Traction power supply could be strained by a combination of more trains operating close together within a power section, especially when service closes up thanks to ATC during delays. Existing trains can run at a higher speed under ATC control, but this increases their power consumption. Fire ventilation must be improved to allow for the larger number of trains and passengers that will be in the tunnels and stations. The current fleet is too small to operate the target levels of service. Having more trains drive up the storage and maintenance requirements. Concentrating too much train storage at one location can produce bottlenecks for service loading and unloading as the TTC has already discovered at Wilson Yard. A new yard is planned in Richmond Hill, but that will not be available until the extension north from Finch opens. System management facilities and practices will have to adapt to the higher demand placed on the subway. The Transit Control Centre will have to be expanded, and some systems such as Communications improved. Operating procedures will have to change both for train crews and for service management. One person crews bring savings, but also introduce challenges especially for emergency situations. Ongoing repair of tunnel lines must be a priority to ensure the integrity of the subway structure. With more service, and potentially faster service, more track maintenance will be required to ensure safe operation at the service design speed. All of the additional service and maintenance will require additional staff to operate and manage the line. In brief, the TTC faces substantial changes in how it operates the subway and the resources needed to accomplish much greater capacity. This process will be replicated on Line 2 whenever the TTC reaches the point of enhancing service on that route. From the long list above, the study has flagged several items as all being required to achieve increased capacity. This is not a question of cherry picking “solutions”, but of recognizing that the subway is a collection of interconnecting parts and procedures. There is a long list of planned actions starting on page 9 of the report, and I will not attempt to summarize it here. However, this table subdivides requirements depending on the target headway, and it is far from clear that the 100 second headway can actually be achieved except for brief super-peak platoons of service. If the lower limit proves to sit at, say 110 seconds or more, then the crunch on capacity will arrive much sooner than this plan anticipates. Longer trains might be achieved with a seventh car pushing train lengths to the full platform length of 500 feet or possibly a bit beyond. However, this has implications for some existing track layouts (pocket and tail tracks) and yard/carhouse facilities, not to mention for the signal system (train stopping locations) and the geometry of any platform edge doors that were designed for a different train length and door configuration. Work is already underway on the portion of the line between St. Patrick and Rosedale. 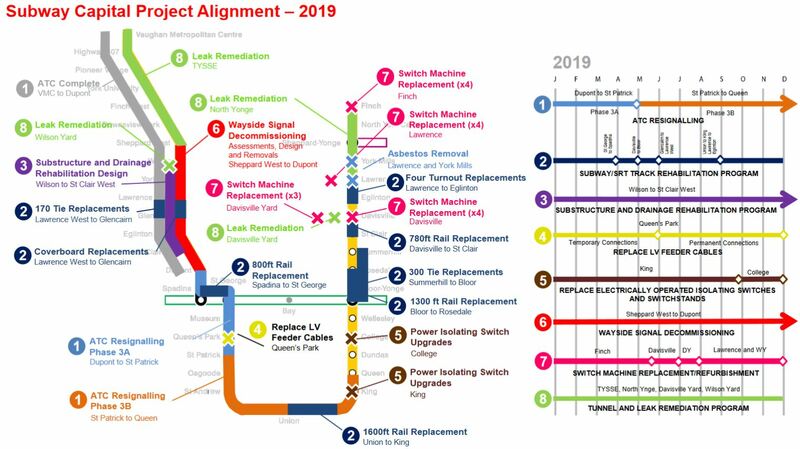 One problem that arises from the delay is that Eglinton Station will see major changes, including a shift of the platform, as part of the Eglinton Crosstown project scheduled to complete in late 2021. The break between the sections south and north of Eglinton corresponds to the Crosstown’s schedule. It is not clear what will happen to the ATC plans if the Crosstown project slips. ATC operation has improved the throughput of trains on both branches of the route even though it only now operates on the Spadina portion. Some of the improvement on Yonge is due to more reliable service arriving from the University leg, and some is due to the better management of service including the return of gap trains to the schedule. These had been used to fill in for service delays, but were cut in past years as a money-saving measure thanks to tax cuts taking precedence over transit operations. 3 months: TYSSE opening caused other work to be deferred. 9 months: Shifting the priority of Wilson Yard conversion from Phase 6 to immediately following TYSSE. 9 months: Divide phase 3 (Dupont to Rosedale) into three sections. Extra time is planned for installation and testing, and this is constrained by available work windows and special events. 9 months: Addition of Davisville Yard to the project. 3 months: Adding ATC or ATP (Automatic Train Protection so that the signal system can detect work trains. It is not clear that all of these delays would be cumulative as, for example, work car modifications can occur in parallel with installation of ATC on the line. A major review of the project was conducted by Transit Systems Engineering in 2018 and concluded in January 2019, based on the cover date. It is appended to the TTC report. 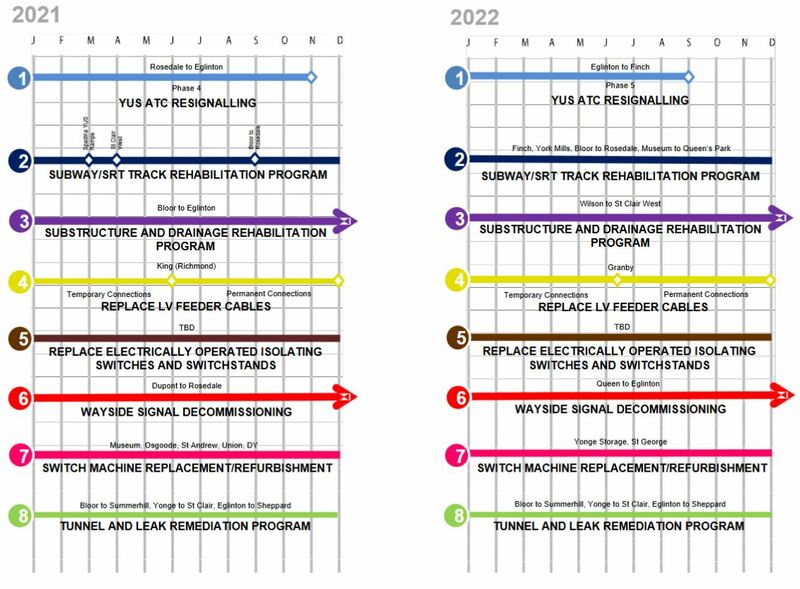 The review begins with a summary of the history of the signalling contracts for Line 1. The details are all there, but it omits some of the political history about the scope of work and technloogy choices for early stages of the project. For example, when this all began, the primary job was to replace the outdated signal system from the 1954 Eglinton-to-Union subway. This was a small enough project that the then Chief General Manager (a title now changed to CEO) Gary Webster felt he could obtain political approval. The era was one of fiscal restraint and a love for announcing new projects. This replacement remains outstanding and will not be completed until 2021. This is no surprise except in the context of management who are trying to sell politicians on the need for a systemic approach to system capabilities and capacity, and the need for very large spending to achieve it within existing rather than new lines. For me, Webster’s failing was to downplay the need for a parallel route rather than recognizing the scope of work that would be needed to increase capacity on the Yonge line. He argued “why build another line when you can put more passengers on the one we already have”. TSE expects the project to be delivered on the revised schedule (which at the point they wrote their report was Q3 2021, not 2022), but they were concerned about “infrastructure upgrades, operational changes, organizational readiness and system improvements” needed to support ATC. This comes from their review of the TTC overall where considerable effort and expertise was focused on the ATC project, but many of the ancillary works did not receive the attention and co-ordination they required. This will not amaze anyone who has seen the TTC’s tendency to be quite siloed in its organization and planning. Among their recommendations is that the operation of the planned line under ATC be extensively modeled to ensure that the goals of closer headways can actually be achieved and sustained under typical day-to-day conditions, not just as a theoretical best case. Considering that the TTC has routinely achieved 90% or less of its scheduled service for years, this is a perfectly reasonable goal – prove that the technology can actually support future plans. Indeed, nothing prevents the TTC from constructing a test operation of more frequent service on the completed portion of the ATC project between Dupont and Vaughan. It would not take long to see how much shorter headways can become before bottlenecks, either physical or organizational, prevent reliable operation. Indeed, letting the signal system run such a trial completely automatically would prove once and for all what the best case situation might be. The big piece that is missing from the project plan, according to TSE, is risk assessment – the determination of factors that could affect project delivery and how these might be mitigated. A related issue, of course, is the question of whether the system can ever meet the goal of a reliable 100 second headway. If the TTC assumes this is possible, and they prove to be wrong, that risk cascades into other projects such as the need for more capacity parallel to the existing line. Any future large scale train control projects should have a “comprehensive management structure” so that all aspects of the project including changes needed beyond just the signalling are understood and managed as one entity. Within the detailed review of the project, TSE identfies several risks that relate to failure to define goals, and an assumption of a business-as-usual approach to operating the subway. The status quo barely gets by on good days, and simply will not work with Line 1 pushed to the limit of its capacity on many fronts. Moreover, as TSE points out, any design and management plan must be capable of working, even on a less than ideal basis, when there is an emergency and some part of the line ceases to function. Subway riders know that this type of situation happens all of the time, and the TTC needs to understand how to adapt particularly if the line will have almost 50% more passengers than it carries today. 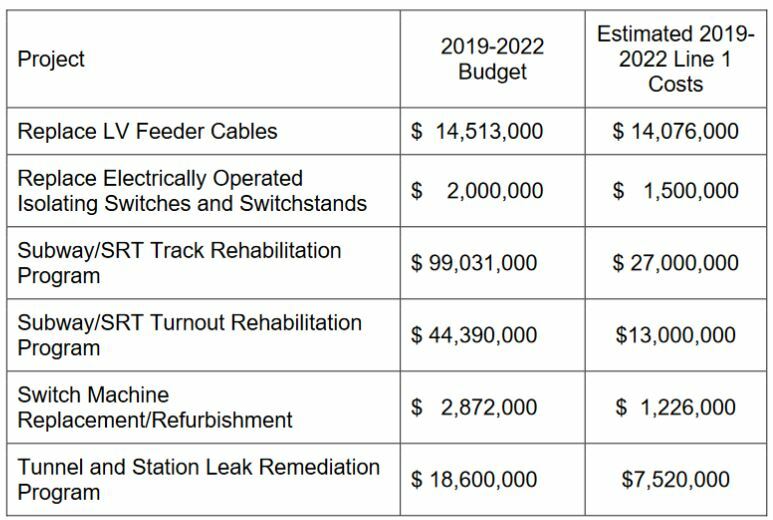 Anyone interested in the full implications should read TSE’s report to understand just how pervasive a change is coming if the TTC hopes to achieve close to the hoped for benefits of Automatic Train Control. Finally, although this is beyond the scope of these reports, there is the matter of ATC for Line 2 Bloor-Danforth which, thanks to management decisions, has been pushed off into the late 2020s. The same type of work is needed to define future demand and capacity needs and an implementation plan for whatever changes are required. Whether the subway is “owned” by the City of Toronto or by the Province of Ontario, these projects will not go away. Not only must they be planned in detail, but they must be funded even if this doesn’t provide a ribbon cutting every other day. This entry was posted in Subways. Bookmark the permalink. [The complaint, as raised by Vice Chair Alan Heisey, was that the Board had been told repeatedly that the ATC project was on time and on budget, only to find that it was not. As to uploading, it seems the deaf are leading the…deafer. As someone who worked on TTC’s ATC project about five years ago, all of these problems such as headway limitations due to turnbacks at terminal stations, platform constraints at busy interchange stations etc. were quite evident even back then. It is too bad no one did anything about it as everyone was too busy searching for the next job. It was remarkable how much money was wasted particularly when TTC was trying to install CBI alongside ATC from different vendors. The ATC project was an example of folks sometimes not knowing what they were doing, and at other times looking the other way because it was more convenient. The lack of transparency and honesty when it came to reporting made the problems even worse. Perhaps the upload will lead to changes in governance at the TTC although I am not holding my breath for it. It’s all rather sad, the left hand seems not to know what the right hand is doing at the TTC on many projects including the automation of the subway system, the subways being currently built & the roll out of Presto on TTC’s Wheel Trans fleet & contract drivers at Coop & Beck. This is the first I’ve heard of a new north-south line after the Relief Line North. Any idea what that might be? Of course if the “light” design gives us, say, 60% of the capacity for 80% of the cost of a traditional subway, then it’s probably not worth it.